The summer that eleven-year-old Eva is picked up on her fourth shoplifting charge, her mother, Miriam, decides that the only solution is to move from Manhattan to a quiet town in upstate New York. There, she tells Eva, they can have a “normal” life. But what Miriam doesn’t tell her daughter, or anyone else, is that Eva’s stealing scares her for a different reason, one related to a past she has been trying to ignore. As tensions mount between mother and daughter, it is, oddly enough, Eva’s secret friendship with Burl–a reclusive beekeeper who lives down the road–that ultimately helps the two find their way back to each other. 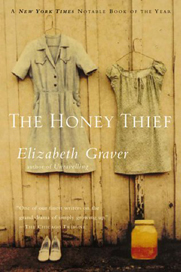 The Honey Thief is a haunting, lyrical novel about the shadow the past casts on the present, the workings of memory and desire, and the healing powers of unexpected friendship.